At least John and Barry got the cherry-red banner correct. The rest is what it is…..Soviet style propaganda on steroids. U.S. average temperature has risen more than 2ºF over the past 50 years and is projected to rise more in the future; how much more depends primarily on the amount of heat-trapping gases emitted globally and how sensitive the climate is to those emissions. They cherry-picked a start point at a local minimum. There has been no net change over the past century. The reason why they expect temperatures to increase as CO2 increases, is because they are tampering with the data in proportion with atmospheric CO2. It is 100% fraudulent self-fulfilling prophesy. In 1977, the US had a spectacularly incompetent left wing president. It was cold and snowy in New York. The jet stream made Alaska warm, California dry and brought snow to Florida,. Everything was identical to the present, except for one thing. 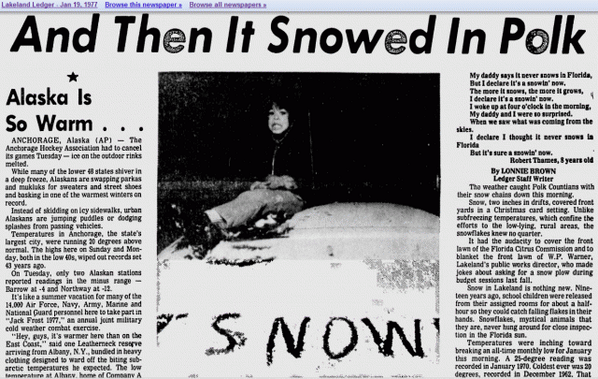 In 1977, experts blamed it on global cooling, instead of the current global warming wankers. 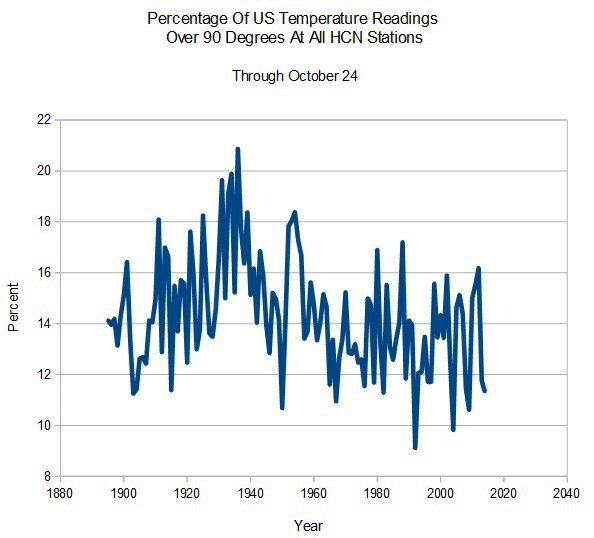 As of 1999, NASA GISS showed the US in fairly strong cooling trend since the 1930s. That didn’t suit the global warming agenda, so they have repeatedly cooled the pre-1960 years, and warmed the years after the 1960s – in order to create a warming trend which doesn’t exist and didn’t happen. The frequency of hot days in the US has plummeted since the 1930s. The people at NCDC and GISS are defrauding Americans with their data tampering. 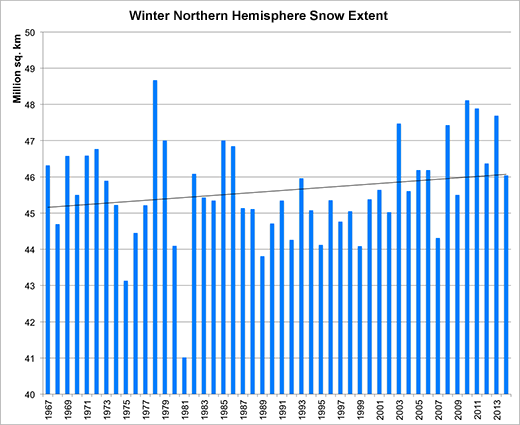 Winter snow cover has soared to record levels over the past decade. As always, the New York Times is lying – and saying the exact opposite of the truth. The usual group of government funded criminals are out in force tonight, claiming that an overheated atmosphere is causing the snow. As always, they are lying. 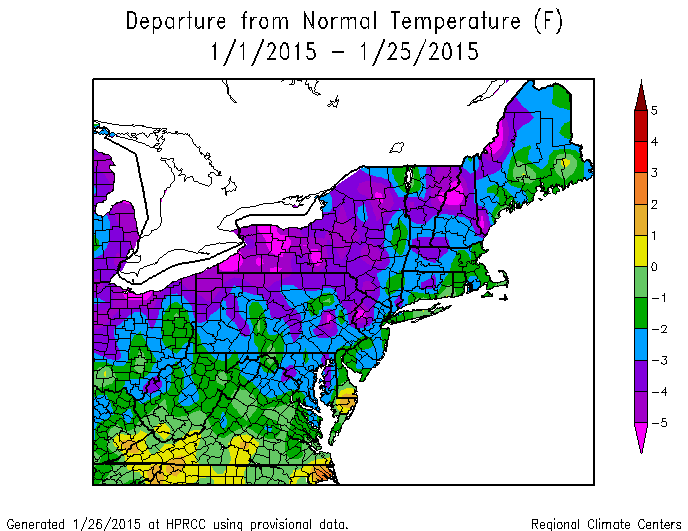 New England is having one of their coldest winters on record. Not surprisingly, winter snow cover correlates well with winter temperature. During colder winters, the snow line moves further south. During warmer winters, the snow line moves further north. The reason why we are having snowier winters, is because they are getting colder. Any four year old could have figured this out, but not a climate expert or a progressive. So basically, Gavin and Tom make up fake raw +4C data, extrapolate it out into regions which have no data, ignore the cooling regions, and report to the press a record temperature by 0.02 degrees. Can science get any worse than this? The post 1940 cooling wrecked the hockey stick, so government climate scientists realized that they would have to make it disappear, in order to keep their funding coming in. Some of the most prominent cooling was in Iceland, so Tom and Gavin simply made it disappear. They were also quite successful at making the cooling in the US disappear. The global warming scam is a complete fraud, which is why a personality like Barack Obama is so attracted to it.